America, you're fat. Sorry to break it to you. Just because you call them "sliders", doesn't mean you should swallow 15 little burgers in one sitting. Well, marketers have definitely taken notice of your glutenous ways. 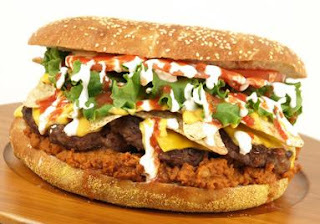 Minor league baseball is popular for two reasons; drinking promotions and crazy food inventions. You want a hamburger between two Krispy Kremes? No problem. Those Oreos and Twinkies aren't hitting the spot? Let's deep fry 'em. It's 5/3 lbs (1.66) of beef with lettuce, tomato, salsa, sour cream, chili and Fritos on an eight-inch sesame seed bun. 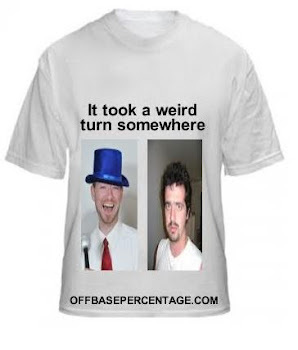 The team says it feeds one to four people and sells for $20, and if a person finishes the Fifth Third Burger in one sitting, the team will offer up a Fifth Third Burger T-shirt. If you finish that in one sitting, they probably don't have a t-shirt in your size. Which I assume is circus tent. This is what it looks like so you can have a mental picture when you take your scooter to your minivan and head to Michigan. 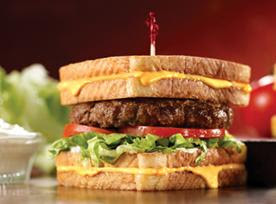 Yes, the latest assault on America's waistline comes in the form of Friendly's recently launched Grilled Cheese BurgerMelt. Move over, Double Down, there's a new "something with far more calories than bread as a bun" sandwich in town. Grilled cheese sandwiches are not buns, they're sandwiches! Yeah, chew on that. If you'll excuse me, I need to send McDonald's an email pitching the McFatty™. It's a Big Mac topped with a 9 piece McNugget.